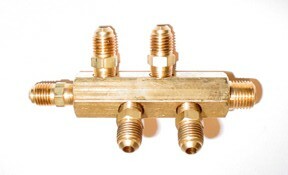 CO2 manifold allows you to run numerous syrup pumps or tanks at the same setting to which you have the psi dial set. Five (5) 1/4" male flare fittings allow you to attach your 1/4" swivel nut and barbed hose fittings. Right hand 1/4" thread easily screws in the bottom of any standard regulator.